I thought it would be useful to highlight the incredibly small sample base of HMRC's tax gap data for direct taxes, published this weak. As I have explained at length here, HMRC have got a reasonable methodology for estimating the tax gap for VAT and other direct taxes and one that is hopelessly inadequate for calculating the tax gap on direct taxes like income tax, national insurance, corporation tax and capital gains tax. The main methods used to estimate tax gaps for direct taxes are random enquiries, risk registers and data matching. These are discussed in more detail below. In addition, where robust methodologies have not yet been developed, an illustrative estimate of the tax gap is given based on expert opinion or derived by selecting the nearest equivalent measured gap. Random enquiry programmes involve samples of taxpayers being selected at random and their returns being subjected to full enquiries by HMRC officers. HMRC has random enquiry programmes for individuals subject to Self Assessment, small and medium-sized businesses subject to Corporation Tax Self Assessment and small and medium-sized employers. The sizes of the samples for the three programmes are shown in Table 7.1 below. Some of the data in this table does itself give rise to enormous questions of credibility. For example, can anyone, for a moment, believe that HMRC really did exactly 1,649 PAYE audits without ever varying by just one more or one less in each and every year from 2000 to 2008? I candidly simply do not believe them. That is not plausible and to publish date of the tax cut on the basis of such utterly implausible data undermines the credibility of any resulting estimate, completely and entirely. 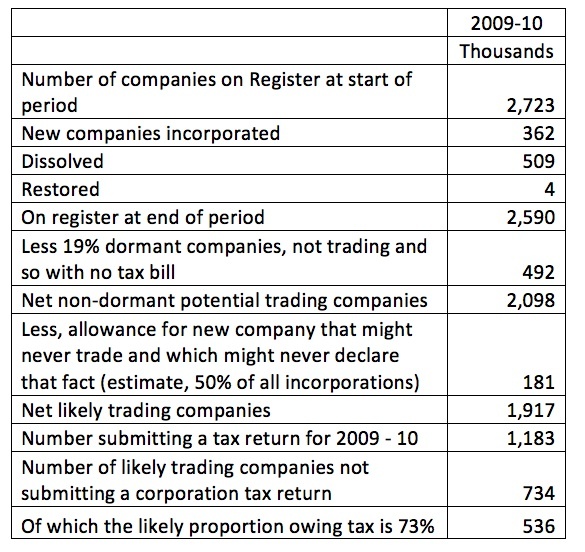 In 2009 over 30% of companies in existence weren't asked for a tax return by HMRC, a rapidly increasing trend. Only 18.5% of companies certified themselves dormant. But note: we don't know the dormants and the companies not asked are the same, and nor do HMRC. Nor do we know they're actually dormant and HMRC definitely does not. They have no way of knowing - the data is not available to them (I've checked, I've asked). All we do know is HMRC turned a blind eye. None of those companies submit a tax return. So they can't be included in the tax gap data because that's based solely on those who do submit returns. But what the heck? Why worry about organised crime that abuses this it evade tax, or estimating how much it's worth? Of the companies asked for returns vast numbers don't submit then - in 2010 over a third ignored the request to submit the return altogether. But they're not in the tax gap data either because HMRC investigate returns they get to form their view - not the ones they don't get. But less than half of all companies submit returns. In 2009-10 there were likely to have been a net 1.9 million trading companies in the UK. I stress: I have allowed for near enough half a million dormant companies and companies that are formed and might never trade in coming to this number, or nearly 700,000 dormants in all. 734,000 of these did not submit a tax return. More than half a million probably owed tax. How many companies did HMRC investigate in the year - who submitted tax returns? Based on the above data, maybe 400. And you wonder why we have a tax gap? And you wonder why I say their data is wrong? And that's not the only absurd ratio to be picked out from this data. There are near enough 30 million tax payers in the UK and they randomly enquire of 3,200 a year - a number halved when staff cuts began, please note. The result is a person in the UK is likely to get a random tax enquiry once every 9,375 years, or thereabouts. That's a massive deterrent, isn't it? And also a far from adequate base for extrapolation of data of this sort. e) How likely it is that the tax gap is vastly bigger than HMRC say (as I suggest, often). But still ministers will argue otherwise. What are they trying to hide? Could it be they really don't want to collect tax from the crooks and the cheats? Is that their reason for denying the truth? Anything else is very hard to imagine. That’s verging on a conspiracy theory. I’m pretty confident that in general, especially given the budget position of the country, both the previous and current government are keen to recover taxes due under the laws in place, particularly given the alternative is to increase taxes, which isn’t likely to be popular with voters. “Anything else is hard to imagine.” In this case, I’m imagining it to be a possibility that (whilst I can see an argument for unpicking HMRC’s figures to an extent) your figures are also not 100% correct. HMRC have access to hard, factual data. We can and certainly should ask about apparent gaps in their data, but we can’t fill in those gaps with suppositions of our own. You’re comparing the number of companies not asked to submit a tax return with the number of dormant companies. That’s not an unreasonable starting point, but we also have to consider why a non-dormant company would not be asked to submit a return. I can think of one example already: a company that HMRC is satisfied is correctly registered and operating as a charity will not routinely be asked to submit a return. That could easily be 100,000 of your missing returns in itself. You’re also making a 50% allowance for new incorporations that never trade BUT basing that on the in-year incorporations. New incorps that never trade don’t automatically disappear from the register at the start of the next year, so you need to allow for non-trading new incorps from prior years as well. There is no way of making a sensible stab at this without doing in depth, evidence based research. It’s not unfair to treat HMRC’s figures with some reasonable scepticism, and to ask them questions where you think you’ve spotted holes. It is unreasonable to not ask them those questions, and to instead make up your own figures. I’ll agree that you can have a professional scepticism over HMRC’s figures, where you don’t think they stack up. However, whilst you are using estimates rather than evidenced analysis, your figures don’t carry academic weight. By that I mean you have to be able to point to a whole bunch of named companies that show a UK profit and no UK tax and that haven’t been asked to file a return. Also, your analysis explicitly does not allow for 100,000 charities, who aren’t routinely asked to file returns, but are not dormant and are on the companies register. Only HMRC have the answers! This is not academic? a) Who cares – if I’m 100,000 companies out (and I’ve said it’s an estimate) the problem is still massive b) Don’t you know all academic numbers involve estimation c) Don’t you know HMRC data is riddled with estimation? d Don’t you know all national accounting is estimation? And don’t you realize they won’t file account either? That’s what my report also shows? This analysis is as disturbing as it is revealing – I’m finding it difficult to interpret the figures any other way. Your final comment is particularly resonant. The evidence before us makes a case for what we all instinctively suspect to be true: that by and large our government is not only unwilling to do what is necessary to balance wealth but it is deliberately obstructing the process. Other point to consider is that new incorporations normally have losses in a start up phase so probably don’t owe tax for first year or even first few years- which is not to say they shouldn’t be submitting a return obviously! What a bizarre reply to Dennis. You could have said “Yes, fair point, a lot of start-ups do indeed makes losses, I’ll go and revise my figures to reflect the fact that many of these companies won’t pay tax at all in the first few years”. But no, instead you introduce a completely new assumption that most of these companies that we supposedly don’t know anything about are actually service companies, and an only-slightly-less-dodgy assumption that service companies rarely make losses (oh yeah? ), and then finish off with some weird waft at neoliberal economics! But at least I now know that the notion that some start-ups make losses is a neoliberal one, no doubt “to its core”. “most companies are as a simple matter of fact service companies” – interested on whether this is based on statistical evidence or just your own experience? 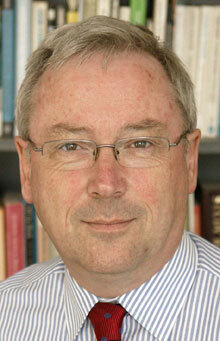 you seem to be suggesting that the number of new incorporations who dont make losses or break even in the first or early years is statistically insignificant in the context of the amount of new incorporations who should be paying tax – which may be the case, but without evidence (and frankly seeking to ignore the question by making such sweeping and dismissive comments) undermines many of the good points you make elsewhere in this article and the blog as a whole. Have you noticed this is a service economy? What I don’t understand is why someone would incorporate, thus putting themselves under the full potential glare of HMRC when they could carry on their trade and evade tax with far less chance of being caught through an unincorporated medium. The idea that people incorporate to evade tax seems faintly absurd. Why even bother taking the risk? An unsubtantiated point that makes no sense at all. Becoming an officer/shareholder of the company entails having your name and address available for all to see on Companies House. How this makes one more anonymous than trading as an individual I can’t for the life of me work out. Do you seriously think all these plumbers, private tutors etc are operating through limited companies, closing them down after a year or so to pull a fast one on the tax man and starting up again shortly therafter? The last thing I would want to do if I wanted to evade tax was to incorporate. A nominee may be no more open an arrangement than an unincorporated medium, but it doesn’t make the operation any more anonymous than a sole trader would be. Why even take the chance? Besides, the person still has to extract the funds from the company at some point to get them into personal hands – in which case what was the point of having a company to evade tax? Why not just have the tax-evaded proceeds coming in and going out of the trader’s hands? Ouch! I don’t think I am being naive – I expect that anyone who wants to make claims of this nature stacks it up with properly evidenced research. One person (you) saying that their estimates are better than anothers (HMRC) doesn’t win the argument or indeed prove their case especially where in this case HMRC do provide the details of how they’ve reached their figures, and which are then underpinned by their internal records of millions of taxpayers (individuals and businesses) and the work based on that. Having done a science degree, I don’t agree that academic numbers are based on estimates: they should be on reliable and repeatable measurements. I’m really not trying to doubt a tax gap: it’s important to me and I’m sure millions of other PAYE payers that I’m not being ripped off by people not paying their tax dues. Clearly I am, to the tune of at least £35bn a year. But at the moment, I trust HMRC’s figures above yours, as de facto they have better access to underlying data than you do. Have you read their report? Now which is more likely to be more reliable? As you know RM I have not always agreed with all your blogs. But being long experienced in the Accountancy Profession and a member of a national tax committee, re small and medium sized enterrprises, of my professional body, may I lend my support to your analysis. I have been saying for years that HM Revenue & Customs have increasingly been operating on an Emperors Clothes basis. At first this view was derided, then humoured, now increasingly supported amongst the those in the profession who are at least fair minded not to blindly follow their vested interests. There is a difference between “dormant” and “non-trading” companies and a significant minority of “trading” companies are not set up to make a profit for themselves. There are thousands of “Nominee” companies whose sole purpose is to be the nominal holder of assets legally separate from a trading company e.g. following the dematerialisation of the vast majority of share certificates all shares handled by CREST have to be held in the name of a nominee company; the freehold of every block of flats is owned by a single-purpose holding/management company that should never make a profit. 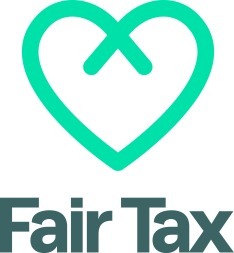 It is also possible that your sample of small businesses is skewed towards those that wanted advice on minimising their tax liability – the substantial number that start-up and subsequently go out of business without ever making a profit are hardly likely to pay for your expertise in taxation matters. PS “For example, can anyone, for a moment, believe that HMRC really did exactly 1,649 PAYE audits without ever varying by just one more or one less in each and every year from 2000 to 2008?” – that sounds totally believable, much more so than that they would change the number year by year, which would require a high-level executive decision. Excuse me, but as an Actuary I constantly have to remind myself that there is a distinction between between precision and accuracy: HMRC are perfectly (utterly) capable of precision, although I frequently query their accuracy (as you do). I did NOT say there were a million nominee companies but there are certainly tens, maybe hundreds, of thousands owning blocks where the lease-holders have bought out the former freeholder. I was not – if you calm down and read my post carefully – saying that you were wrong in claiming that there were companies not checked by HMRC, but that the number of companies that do not owe tax was significantly greater than the number of dormant companies. As I have to work for a living, I do not have time to examine every single company and LLP registered in England & Wales, but the Insolvency Service reports that each year one in 30 of all companies in made insolvent or put into administration because it has lost more money than its shareholders subscribed and its bank are suppliers are prepared to advance in credit. The number losing money each year is much greater. I NEVER said that companies owning freeholds had *automatic* non-tax status – I said that they *should* not make profits: that is not their purpose. You are assuming stupidity which is the case in only a minority of cases. Any profit made by freehold-owning companies comes out of the after-tax income of the leaseholders of the individual flats. Any sensible freehold-owning company (such as the one in which my intelligent mother-in-law is a shareholder) draws funds from leaseholders in proportion to the *discounted* cost of repairs divided by the number of years between repairs so that income over a repair/maintenance cycle equals expenditure. NOR did I say that all companies struck off are declared insolvent or vice versa. In real life there are some insolvent companies struck off because striking off is cheaper than declaring bankruptcy. I was instancing that significant numbers are not only insolvent but certified as insolvent, so your comment emphasises that I was understating the numbers of insolvent companies. Going back to square one, it is very, very likely that there are some companies failing to pay tax but the numbers that owe tax and are not paying is less than you suggest. The interest is tiny (usually less than 0.1%) and almost certainly not worth taking into account in any study like this. Any tax liability below £100 is exempt anway (which is fair enough, because the cost of sending out a tax return and collecting don’t make it worth it). As an example, in 2006/07 (when interest rates were 5%) the sinking fund on our block of flats was running at £62,000 on which interest of about 50 (fifty) quid arose. And that was when rates were 5%! To even generate a tax liability of £100, the interest would need to be about £475, which implies cash at bank of about £600,000 (something which I don’t think many leaseholders would be to pleased about). Why do you suggest it is optional for some property holders and the state should be content with that?